This beautiful Hublot BIG BANG 1905.100.7 luxury watch represents the class and style of every proud owner in a unique way. The Hublot BIG BANG 1905.100.7 luxury watch is an authentic watch of enchanting watchmaking art. The face has Color black and the lunette is 18 kt red gold. The movement is Quarz. To perfect this unmistakable luxury watch, the Rubber bracelet sets a perfect accentuation of the case with . The functions of this luxury watch include Date, Hour minute, Central second. Take a closer look at our Hublot luxury watch. You will quickly see why it is one of the bestsellers in our extensive range of luxury watches. Discover the world of Hublot watches and learn more about Hublot on the Manufaktur Webseite. 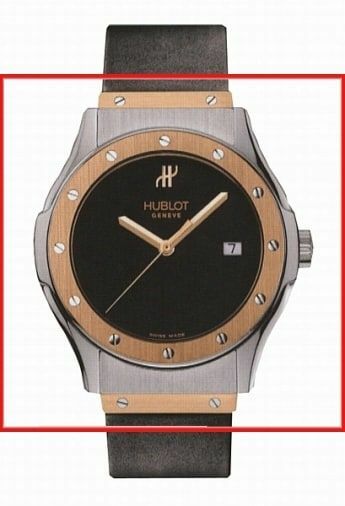 Take a look at our other exclusive luxury watches and see why Hublot and other watch brands are so seductive. Rattapante is a leader in the online luxury watch market. From new, unused to used watches, we offer only the highest quality watches, including the Hublot BIG BANG 1905.100.7.